Just up the road from Wells is a town steeped in legend. A summer destination town for tourists. The place where the wealthy go to relax and spend their summers. Home of a Presidential dynasty with a famous compound. 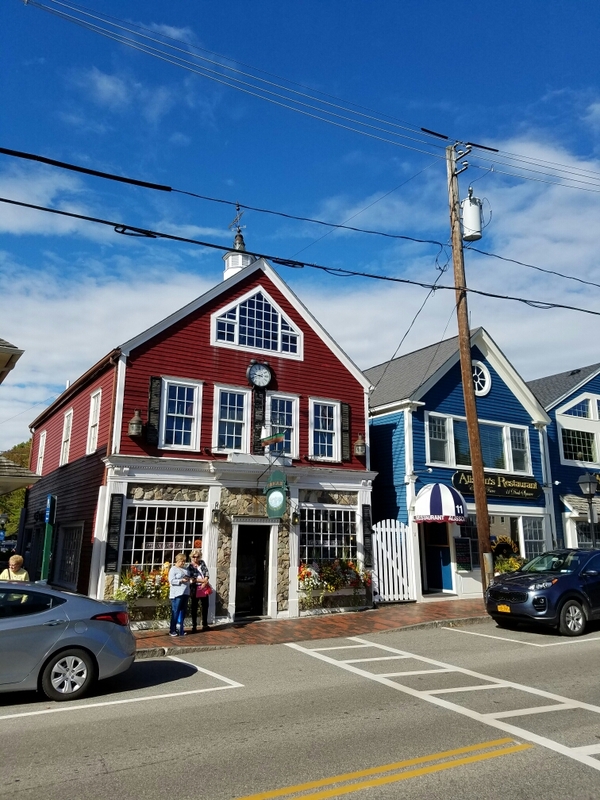 Just the name conjures up romantic images of a fog-shrouded coast with lobster boats visible between the quaint coastal buildings and shops with gold-painted signs hanging over the doors. 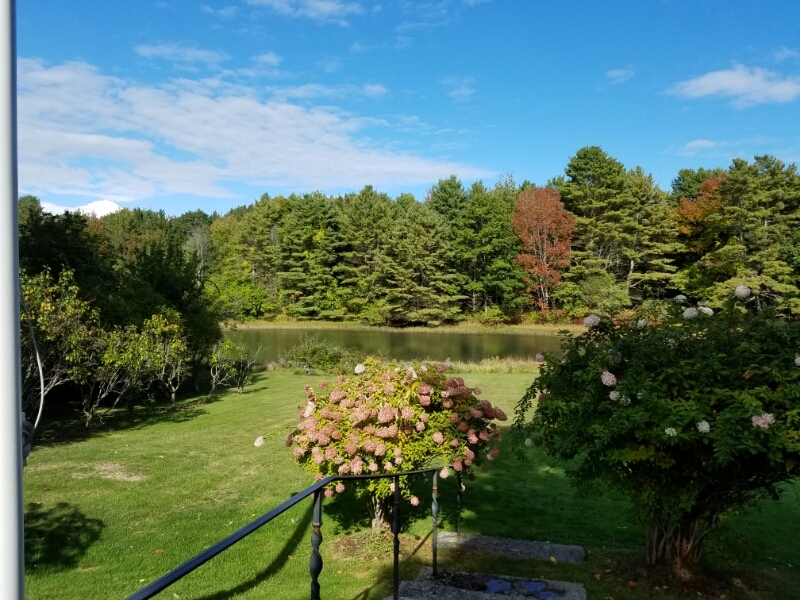 Most people outside New England know Kennebunkport as the place “somewhere in Maine where the Bush family has property.” And its true. The Bush “compound” sits on a rocky peninsula called Walker’s Point a few miles from the small downtown area. Various dignitaries have been guests of Bush Sr. and Bush Jr. including Margaret Thatcher, Mikhail Gorbachev, Nicolas Sarkozy, and Vladimir Putin. I’m sure my invitation just got lost in the mail. President Bush – the first one – was in residence. Secret Service patrols were underway and an exclusion zone was setup on the ocean to keep the curious away. The house is both scenic and forlorn, sitting out by itself on the point exposed to the ravages of the ocean winds and waves. 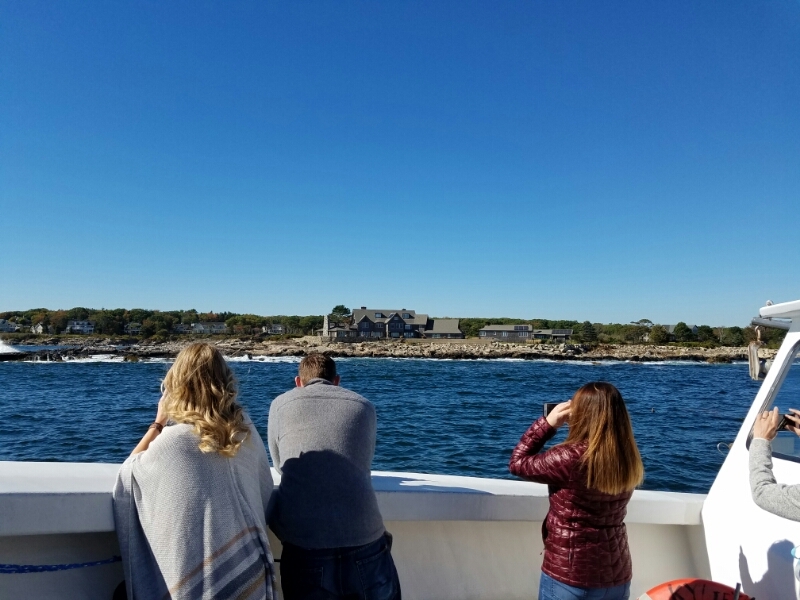 We had hopped aboard a lobster boat/harbor tour and of course as we steamed past Walker Point everyone wanted to see the Bush Compound for themselves. The former President himself was sighted just a few hours earlier sitting in his wheelchair outside in the sun. We did not’ see him on our trip though. More interesting for us landlubbers was the retrieval of lobster traps. 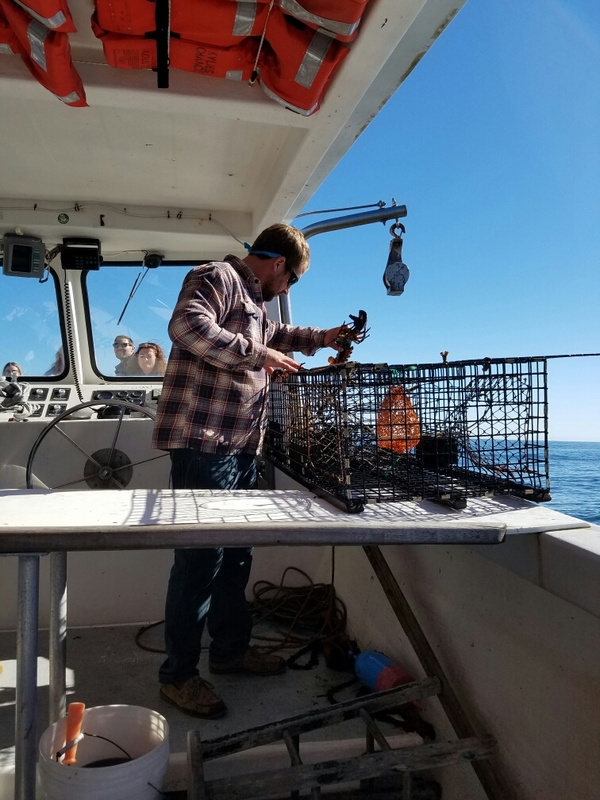 Unlike the massive drift and gill nets or miles-long fishing lines that commercial fishermen began using, lobsters are harvested using lobster traps. 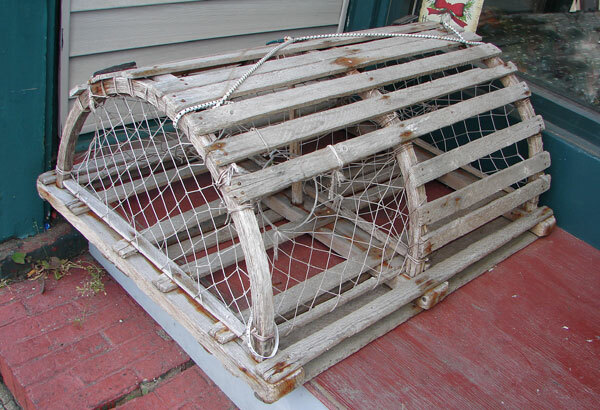 The traps catch only a small fraction of the lobsters in an area. Only one or two in ten lobsters goes into the trap, and most of the lobsters who do enter the trap eventually escape again. This low yield has the effect of preventing the overfishing which has plagued so many other types of seafood. As a result the lobster populations remain robust to this day. 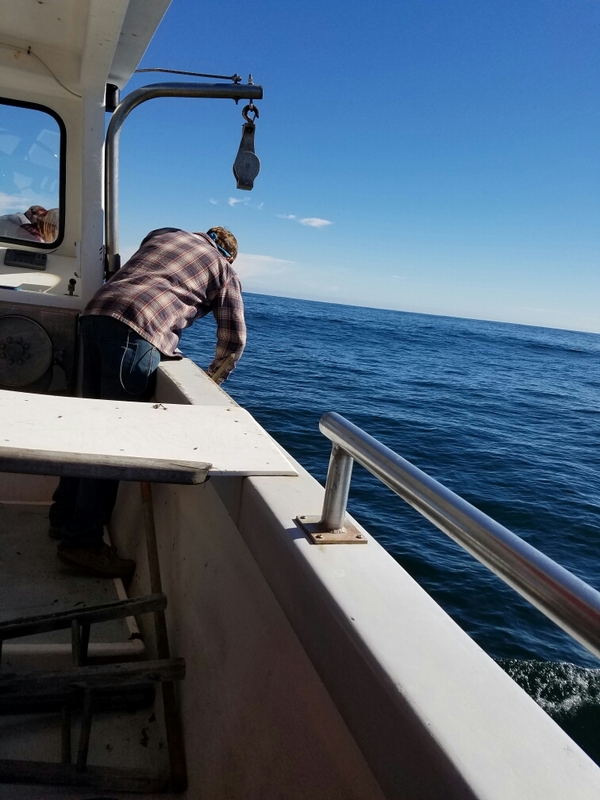 Each lobster fisherman attaches a small buoy to his lobster trap so he can find and retrieve the trap after it is placed. The markings on the buoy are unique so each fisherman can determine which traps belong to which fisherman. Traps are pulled onto the boat, hopefully full of lobsters. Our trap had 3 lobsters inside! Fishermen carefully measure the lobster as only lobsters in a certain size range can be harvested. Too large or too small? Throw ’em back. Also, if the lobster is an egg-bearing female, the fishermen must notch the tail of the lobster and throw her back. Any fisherman who later catches this lobster, eggs or no, must throw her back upon seeing the notch. It is a way to protect the breeding population. 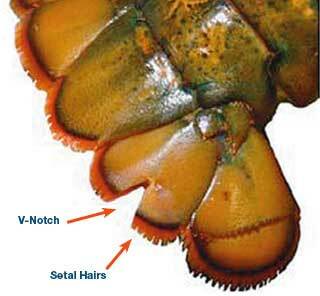 The notch will disappear after 2 or 3 molts and at that point that the lobster can be harvested. 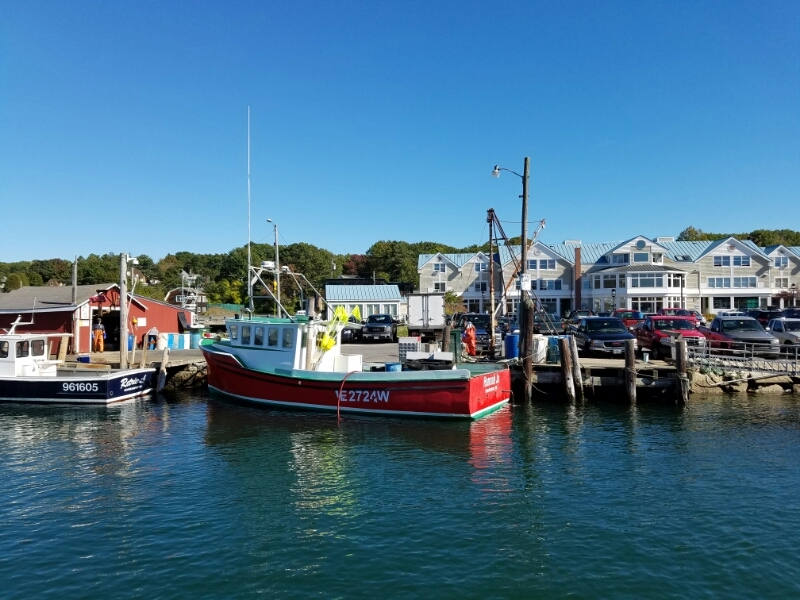 While Kennebunkport is home to multi-millionaires and their multi-million dollar yachts, it also manages to remain a working harbor. Every day lobstermen pull up alongside Government Pier to unload their traps full of fresh lobster for sale to local seafood distributors. 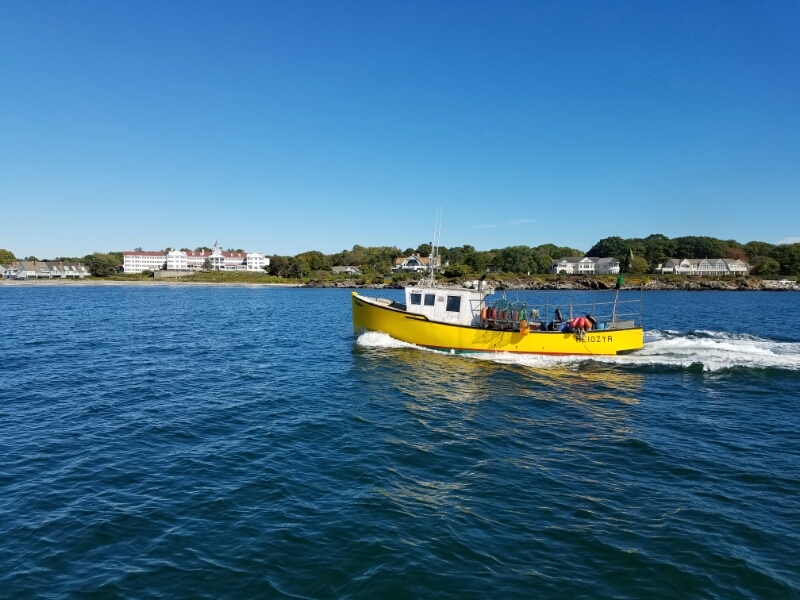 Our trip on the lobster boat was over and it was time to explore Kennebunkport. 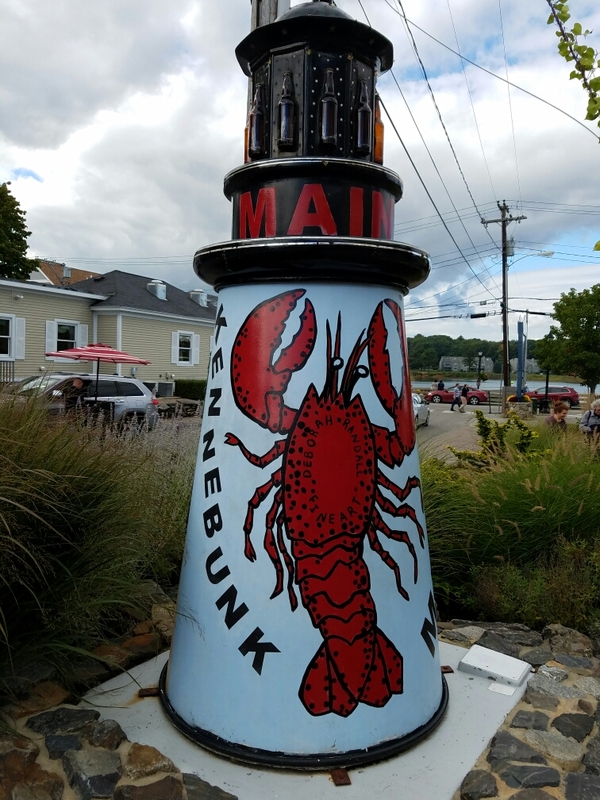 The lobster heritage is visible everywhere, including this miniature model of a lighthouse proudly showcasing the lobster on the town sign greeting visitors as they approach downtown. 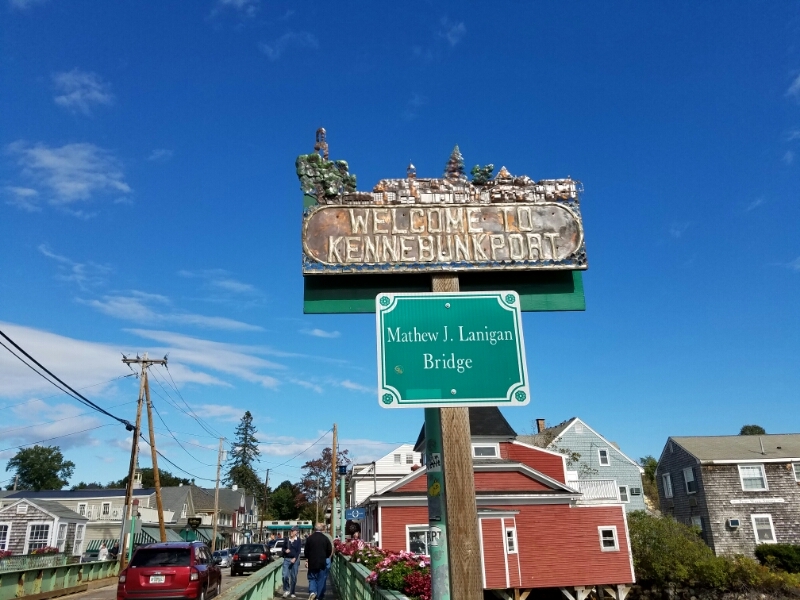 Kennebunkport is a real town. It has about 3,700 people in it according to the latest census. Its history is quite interesting. Founded in the 1663 as “Cape Porpus” by refugees from Massachusets colony and completely wiped out by Native Americans not too long after. By 1689, it was completely empty. It took almost 50 years before re-settlement by Europeans resumed. Even so, it remained a very small town. 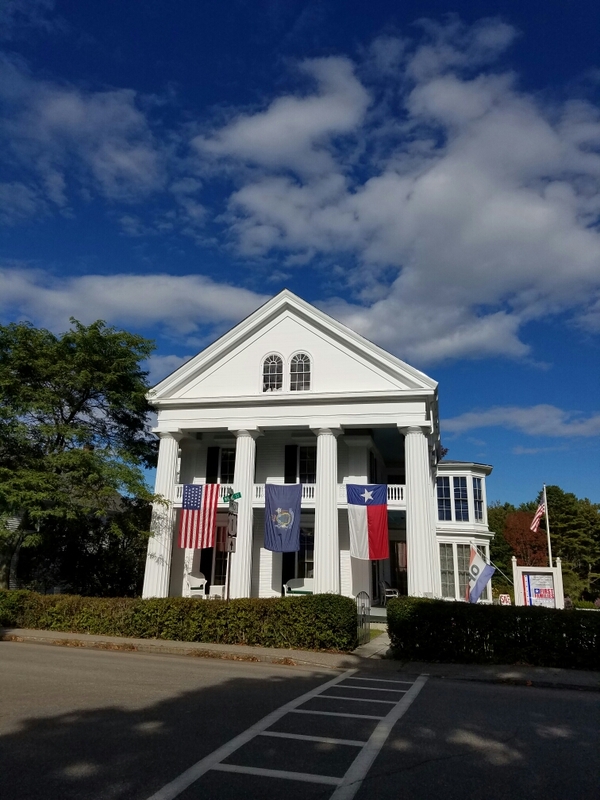 By the 1870s, Kennebunkport had begun to be known as a summer destination for the wealthy of New England. Large homes and hotels were constructed along its coastline. Many of these homes remain to this day. The population peaked in 1840 and then fell, only exceeding the 1830 population in 1980, nearly 150 years later. Even today the population of actual residents in under 4,000. Our first impression however, was not of the houses or the hotels or the residents. No, our first impression was of the tourists and tour buses. I have never seen a town where the tourists outnumber the locals 50 to 1. It was easily as busy as a Disney property. And honestly, it looked like a Disney property. Buses were EVERYWHERE. 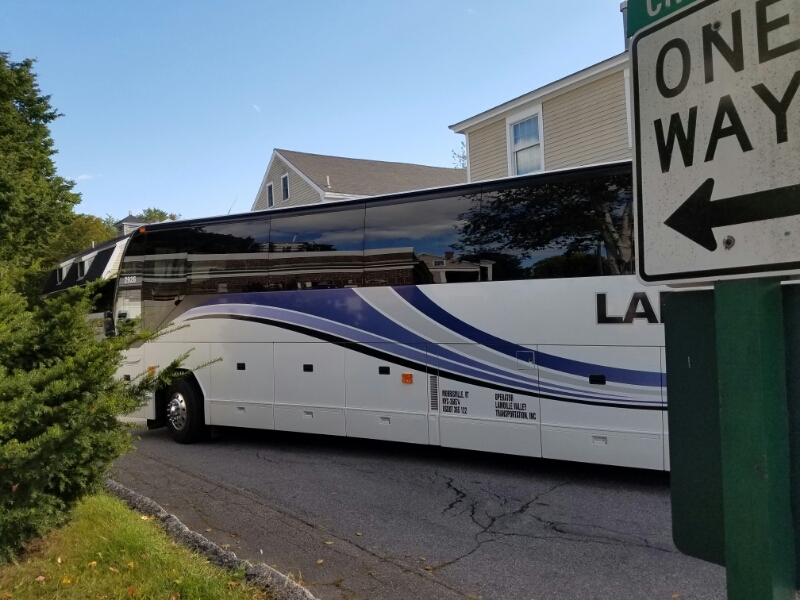 Tours heading to see the fall colors – with a stop at scenic Kennebunkport – were arriving from New York, Boston, Providence, Hartford, Newark, and elsewhere. 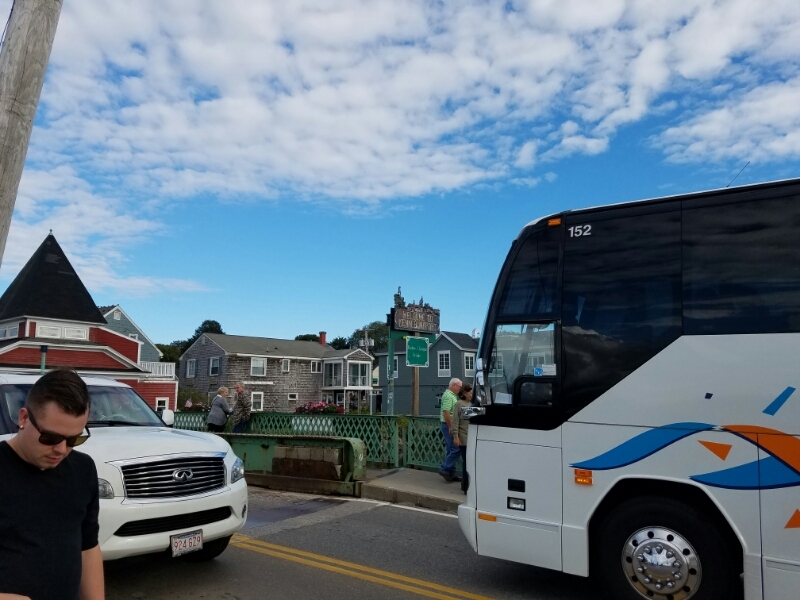 In addition, cruise ships were docking in Portland and disgorging thousands of tourists who were bussed down to Kennebunkport as part of a shore excursion. Every few minutes, another large bus slowly lumbered along the narrow roads, at times blocking all views around its expansive side. 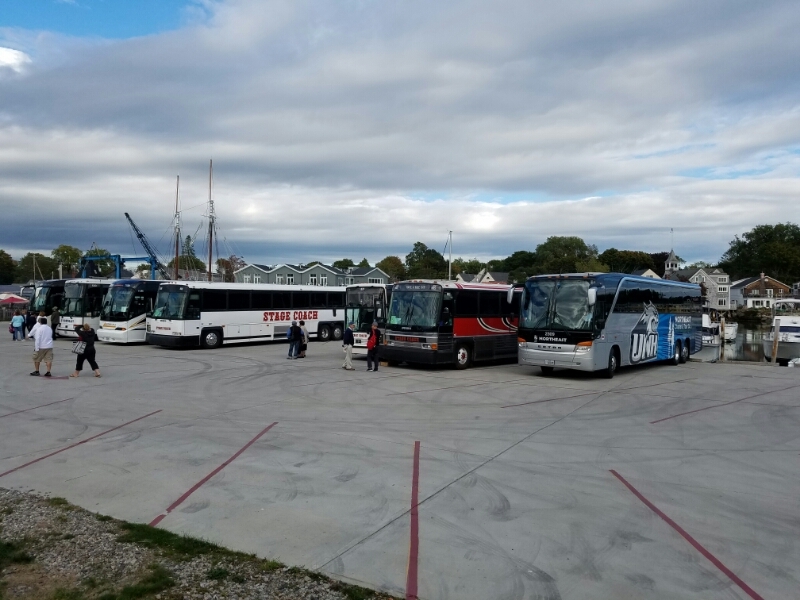 To house these beasts, a parking lot exclusively for tour busses was built right alongside the pier. We counted 7 of them when we arrived, and there were 12 when we walked back past an hour or so later. 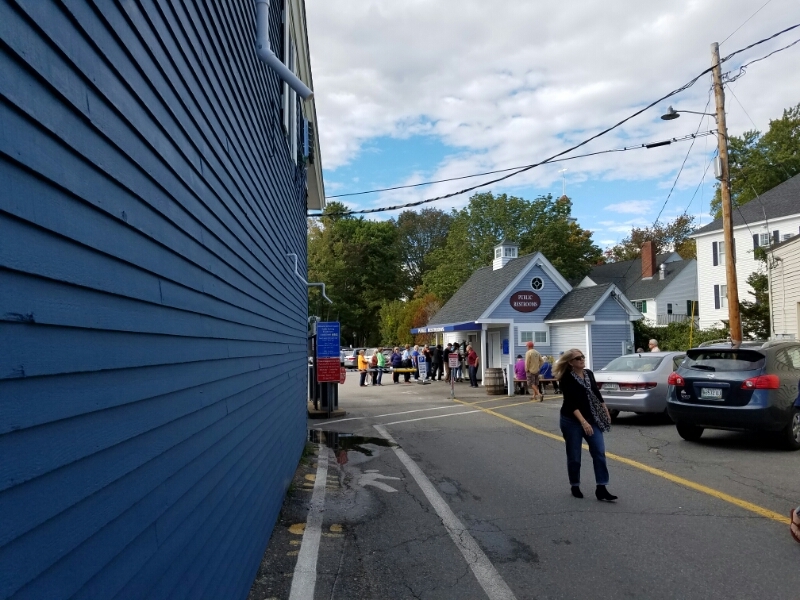 The town wisely built public restrooms and the line stretched out 30 feet or more from the doors. Kennebunkport is super scenic and very compact, so I can see why the tours like to come here. Tiny but very colorful buildings host a variety of shops and restaurants. Some of the shops are very upscale, featuring both designer and local crafts. Others sell T-shirts and magnets. Restaurants also range in quality from the walk-up sidewalk clam shack to a Michelin-star prix-fixe restaurant where advance reservations – and a jacket – are required. The Bush family maintains a museum of sorts just outside the downtown. We entered the gift shop and lobby, but decided not to pay the $10 admission to see the museum. It seemed like a random collection of stuff that we didn’t feel like we had to see. Because the town is so small, it is surrounded by gorgeous wild areas. Well, maybe not wild exactly but undeveloped. 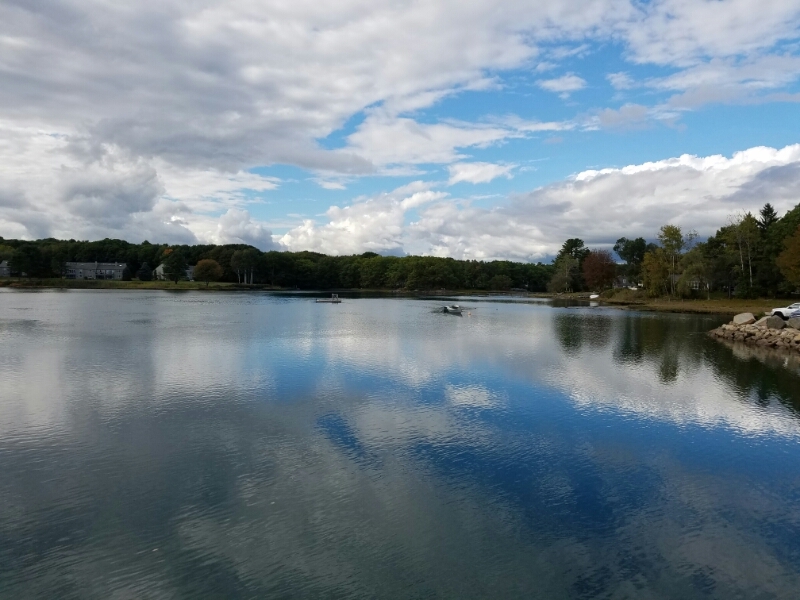 The area around the Kennebunk river where it meets the saltwater from the ocean is especially pretty. This view is the view from the bridge in the middle of the downtown. 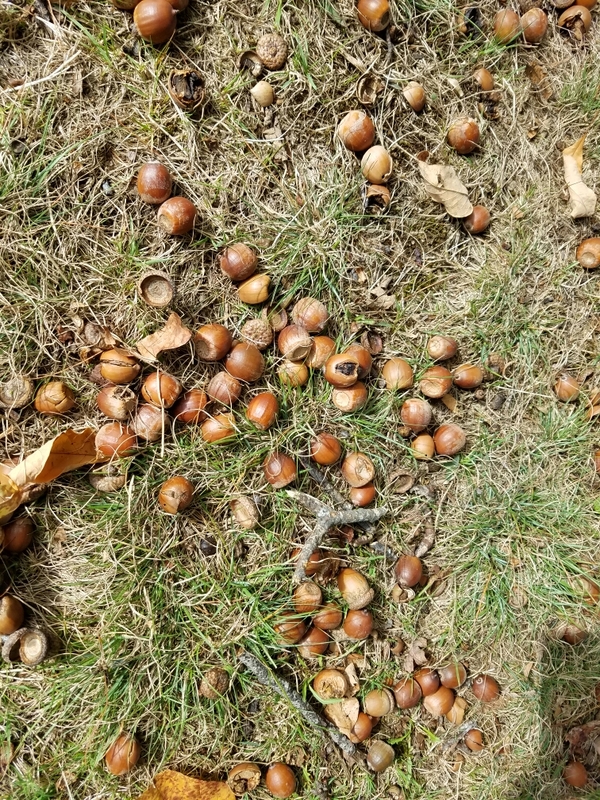 Acorns were everywhere! As a kid growing up in Wyoming, I didn’t think these things actually existed, but they do. I didn’t mention it earlier, but I was actually in Kennebunkport 20 years ago. 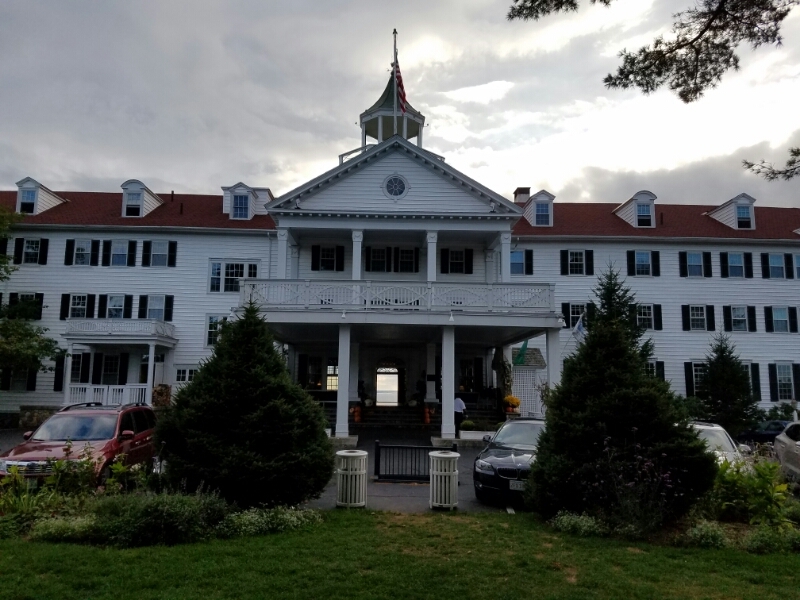 In a prior life, I attended a NEA conference that was held in 1996 in Kennebunkport at a place called the Colony hotel. 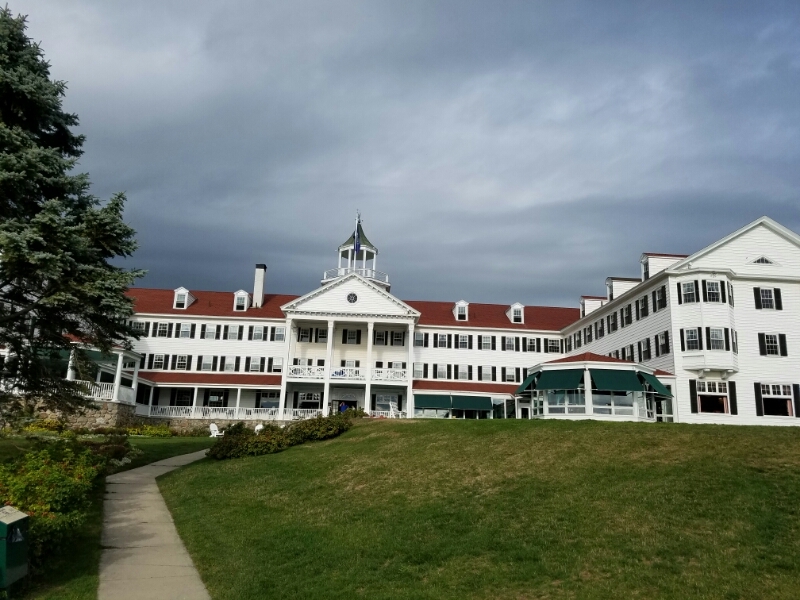 It was my first trip to Maine and one of my first “business” trips anywhere. Pretty schwanky place for a kid from Wyoming. I definitely wanted to see the Colony again. It is about a mile from the downtown area. The Colony was built over 100 years ago in 1914 and remains an iconic location in the area. The front door was open and we could see the ocean through the open door! Talk about an open invitation to come on in! The interior was just as I (barely) remember it. Wood floors and wood paneling with padded velour furniture. 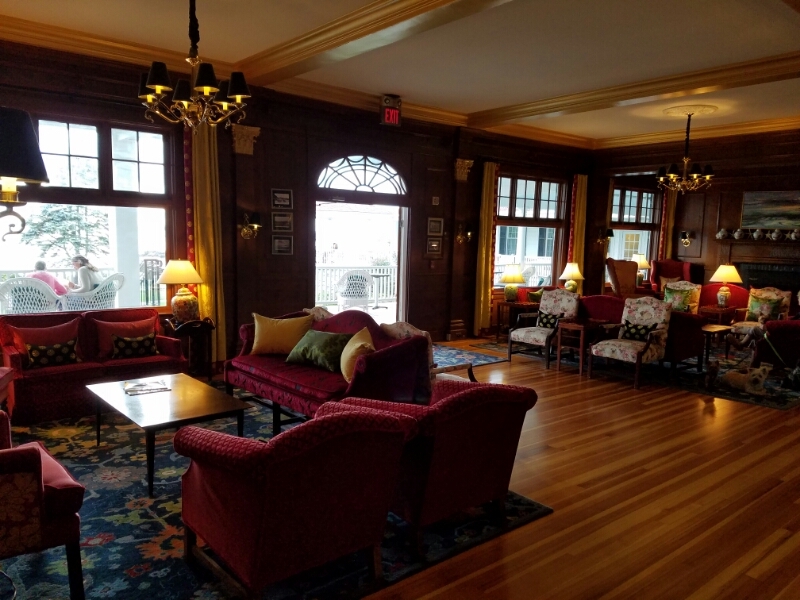 It could be the living room of your wealthy Maine friend who has just invited you over for a drink! 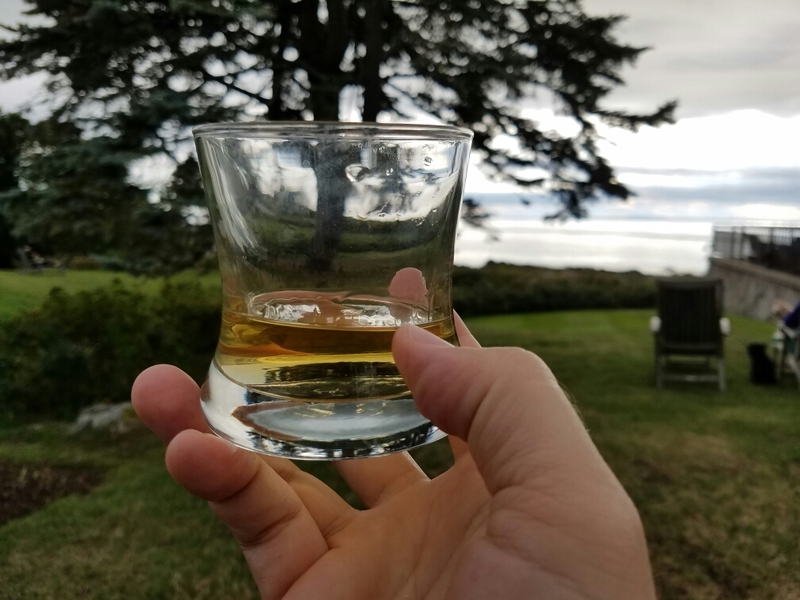 Speaking of a drink, we grabbed a couple of drinks and headed out back to enjoy the views! The views are spectacular. Looking back toward the hotel shows the size and grandeur of the place. To me, it looks every bit of the 1914 hotel and I could imagine guests in the 1920s seeing basically the exact scene we were viewing. Looking out toward the ocean was just as spectacular. Off to the right was the beach known as Gooch Beach and beyond that way off in the distance was Wells. 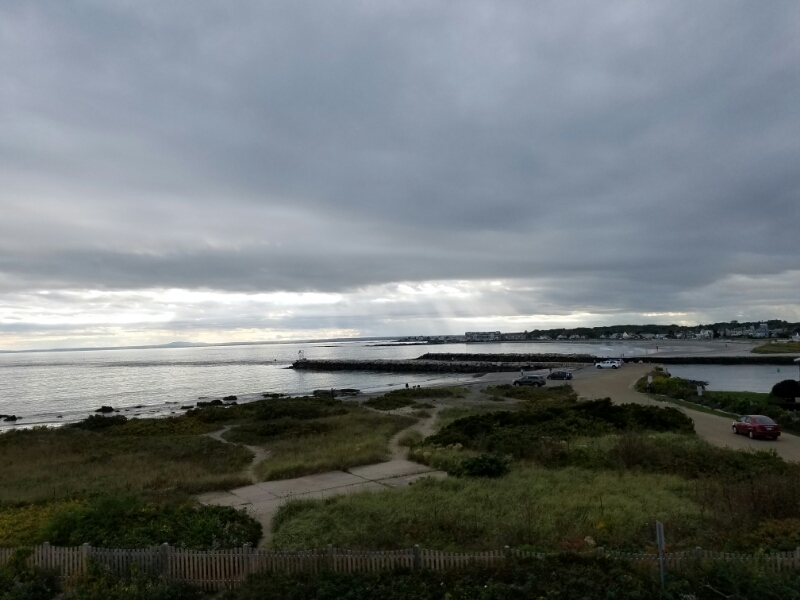 If we had binoculars, we could see Ogunquit. We wrapped up our day in Kennebunkport and headed back toward Wells where we wrapped up our day in the most Maine of ways – with lobster twins! 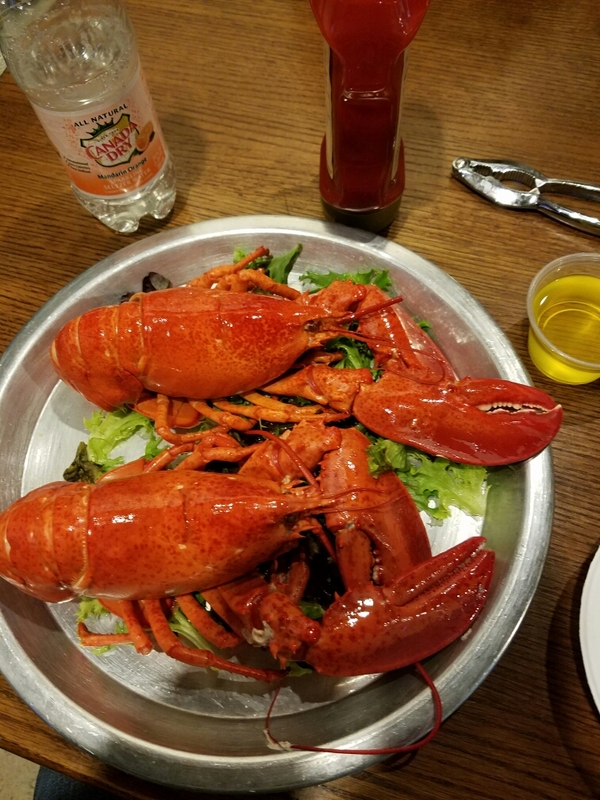 Lobsters were $6.99 a pound at the Hannaford’s grocery store across the street from our campground and they steam them for free. Combined with a little Kerrygold Irish pasture butter makes for a fine supper. Good thing lobsters are sustainable, because I personally ended up eating 14 of them while I was in Maine. We were only in Maine for 10 nights, so I’m pretty proud of myself. 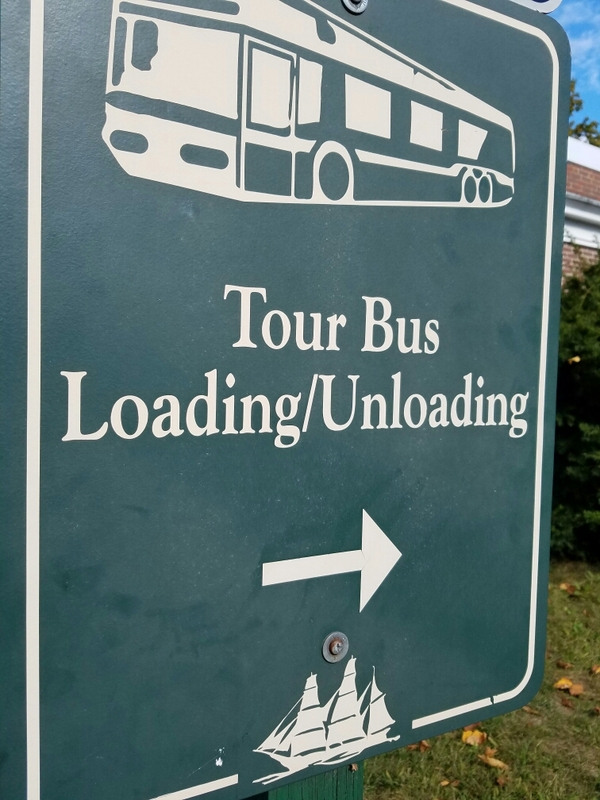 As for Kennebunkport, well, I think they should rename it Kenne-tourbus-port.